It's on The Pirate Bay, with a few odd japanese subtitles at the start of each song, I believe. That's all I got for you, hope this helps. If anyone has dvd cover artwork for this, I'd appreciate it. Cover art links were posted in the appropriate topic a few weeks ago. Hopefully they're still there. THIS TOPIC THREAD NEEDS TO CEASE PER RULE NUMBER FOUR OF THE FORUM. SORRY, GUYS. IT MIGHT BE A GOOD IDEA TO EDIT OUT YOUR POSTS IN THIS THREAD AS I HAVE DONE. Is Song of the South available as a current commercial release anywhere in the world? I thought the Japanese LD was the only version available. If that's the case, I have no problem with this topic. There were also VHS releases in Europe and Canada, and a LD from Hong Kong that doesn't have burned-in subtitles, but I'm pretty sure it's out of print everywhere at the moment. THE LAST PLACE THAT I KNEW OF THAT HAD IT WAS EURO-DISNEY. I'LL CHECK IT OUT AND REPORT BACK HERE. OKAY, YOU CAN STILL GET THE VHS COMMERCIALLY, BUT I HAS NEVER BEEN RELEASED ON DVD ACCORDING TO AMAZON.COM. OKAY, THE VERSION I HAVE IS A LASER DISC TRANSFER. I got a nice copy from the HK LD from superhappyfun -- even has cover art that I downloaded. All of the versions on DVD were either taken from the Japanese LD, which has subtitles during the songs or the Hong Kong LD, which was a rental only item-it was never meant to be sold to the public. The HK LD does not have any subtitles but is slightly less sharp than the Japanese LD, and due to its rarity, fetches nearly $1000 on ebay. There are NO legit versions on DVD anywhere in the world, the "Euro Disney" copies on ebay are just fancy bootlegs. Aside from the LD releases, the only others are a Canadian VHS and a PAL UK VHS. The version that has no subs with the two trailers is the one you want, it is as good as it will get until Disney finally caves in to demand and releases it themselves. I think this illustrates the demand-complete insanity. Finally! The definitive version of Disney's classic blend of live action and animation. NO Japanese subtitles. Digitally remastered with enhanced video and Color, by Cyber-EFX. Since Disney won't remaster it, I did. Includes audio interviews with Johnny Driscol, Luana Patton, Johnny Mercer and James Baskett (Uncle Remus) and other extras. this is from the NFO of the copy I have... I dont have myspleen access so I cant upload it there, but it is being reposted on abm.disney right now, and I can send a couple copies out to anyone interested in paying it foward. Being the Disney fan that I am, this is something I've been trying to get ahold of as well. Ok, I will be paying this foward to jasonrocksout and suntech, both of whom will PiF once they are received. Can I get on the PIF chain guys?? 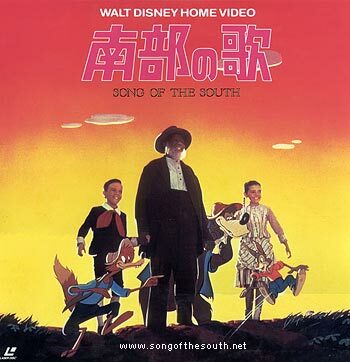 Description: Rare Japanese laserdisc release of Song of the South by Pioneer. Laserdisc has two separate audio tracks: English and Japanese. There are Japanese subtitles only on the title screen and during the songs. Variations: 1990 Reissue cover shown above. Original 1985 cover has a blue stripe across the top with the Walt Disney Home Video logo centered, along with the "Laserdisc" logo on the right-hand side. 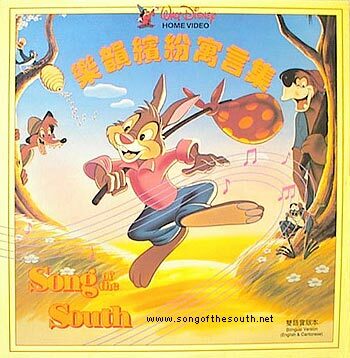 Description: Rare Hong Kong laserdisc release of Song of the South. Apparently these were available only to the rental market. The laserdisc has two tracks, Cantonese and English with no on screen subtitles. Release Date: September 16, 1991. Withdrawn December 18, 2001. 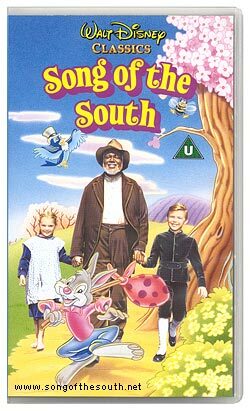 Description: Song of the South released in Great Britain. Variations: Please note that many subtle variations of this cover exist. For the purpose of this page, only the general cover design is being noted. The most recent release was in a blue clamshell case with a Mickey Mouse logo on it. Contrary to popular belief, this was not a "special edition" release. Related Items: Originally released in Great Britain on VHS in c.1983. SongoftheSouth.net is the first web page I found after buying the UK PAL to NTSC conversion in 1999. The first DVD version I got had no menus but a nice transfer (had 4x speed up), the second version was the same UK trasfer with very basic ULEAD DVD 1 menus (same speed up) - then enter version 3 with menus extras and radio spots MUCH better menus and proper playback speed but Japanese Subtiles for the songs. Now, the site was selling the DVD's and VHS tapes for a while but they removed them in 2000 or so (I think) but you could still get one via email - not sure about now as they post ebay links now in their store. BUT MAN I would LOVE to have a copy from the HK LD!! I guess I should have been more clear, all of the DESIRABLE DVD versions were taken from the LDs. Since no one wants to see forced subtitles during songs, stick to the version with the 2 trailers and the radio spot and you can't go wrong.